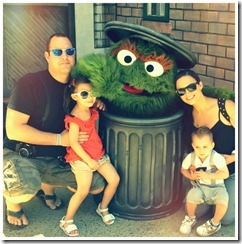 Sesame Street, the quintessential children’s television show, has been loved by generations in our family. As a parent, it’s been amazing to see the show evolve and experience it through the eyes of our children. 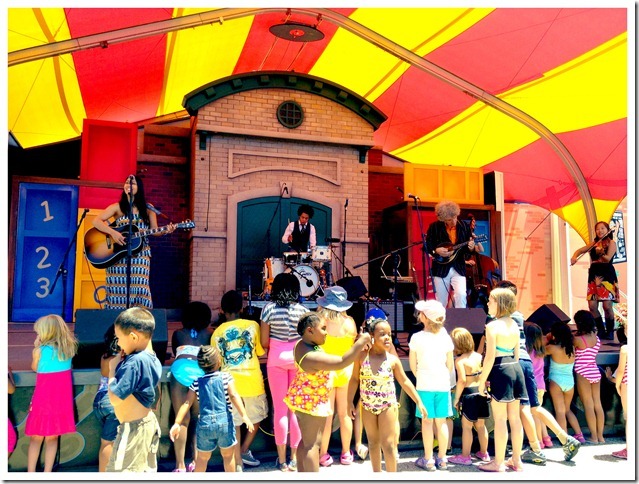 With appearances from folks like Feist, India Arie, and Lin-Manuel Miranda, the show really has appeal to all ages. 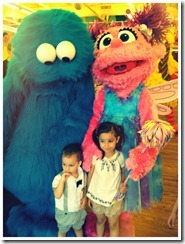 It was the first television show viewed by our children and we consider the Sesame Street characters to be among their first loves. 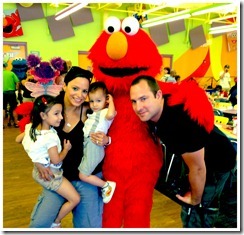 Adrian’s partial to Ernie, and L.P and Elmo go way back to the days of when she called him “ya ya”. 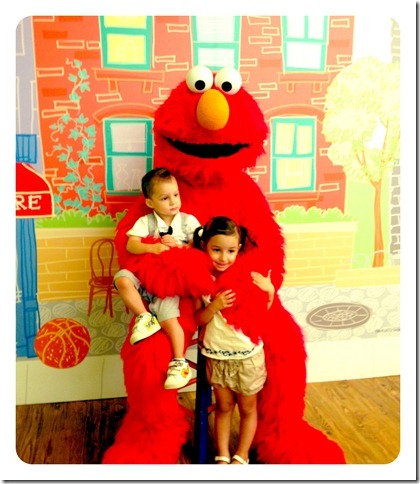 Given this on-going love affair, it’s pretty cool that Elmo and his pals live a mere 90 minutes away from NYC at Sesame Place. 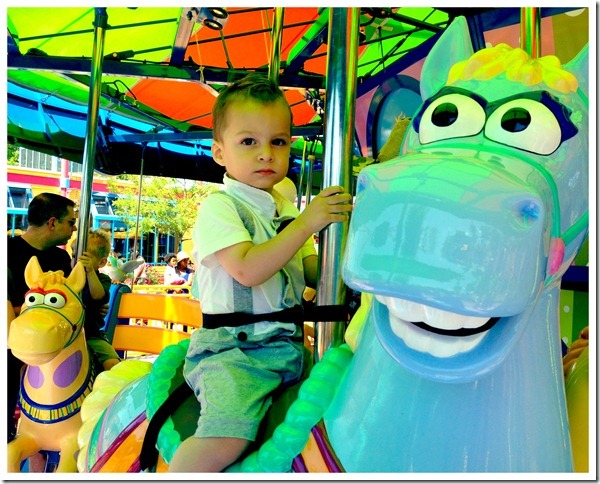 Since Lucia adored her Sesame Place toddler experience, we’ve been looking forward to embarking on another Sesame adventure with both of our children for quite sometime. 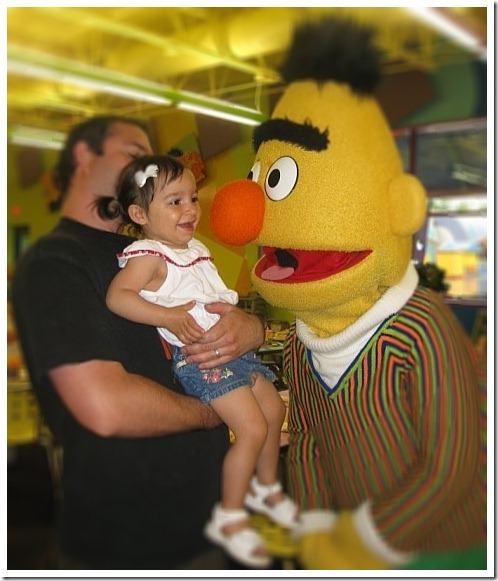 Little Lucia and her friend Bert, back in the day. We were in the midst of trip planning when an invitation to a blogger playdate made it all possible last weekend. 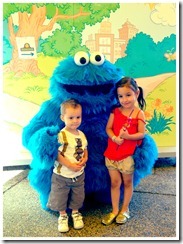 Little ones were literally counting down the days until going to “Sesame Street”. Their anticipation was sweet and exciting. 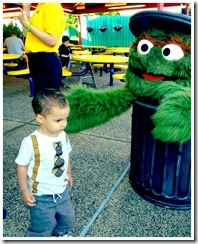 I came armed with a Sesame Place iPhone App. It enabled me to plan our day according to show times, view an interactive map with GPS navigation and search for a restroom (among many other things). Our kids are still in the height of character adoration and meeting them seemed to be their top priority. Luckily, we had many opportunities to do so. 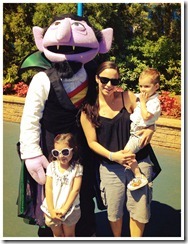 Upon entering the park, Adrian had the chance to tell The Count that he didn’t like his teeth and give his cape a good tug. 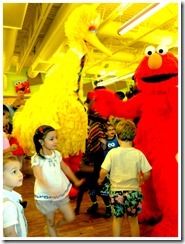 We then headed to Dine with Me for lunch with Elmo and Friends. 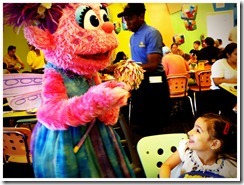 I highly recommend booking a character meal, as they are a memorable way to spend time with all the friendly monsters. We saw so many furry friends, that we didn’t feel the need to take photos at 1-2-3 Smile With Me. To say that my kids loved this experience, is an understatement. They were in full on Sesame heaven. 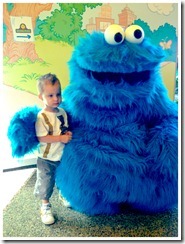 Cookie Monster ate one of our cookies,the kids danced with Elmo and friends and mama cried, (a weakness of mine) during the conga line. As you can tell, we snapped a lot of photos. We then ventured over to the carousel and had the chance to see the amazingly talented Dan Zane and friends perform. We are huge Dan Zane fans and have been bopping around to his music in our home ever since Lucia saw him play “jump up” on Sesame Street. His live show was awesome and packed with positivity – encouraging families to start a “family band” and hanging out after the show to talk to fans. We definitely danced and even had the chance to tell Dan Zane in person how much we enjoy his music. We relaxed as the concert wrapped up and then journeyed over to the pool area to cool off. 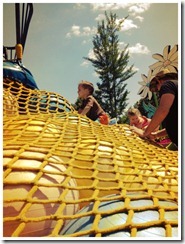 After splashing around in the water, the kids had a ball playing on the equipment and made sure to watch the parade. Thank goodness Adrian finally had a chance to see his beloved Ernie. 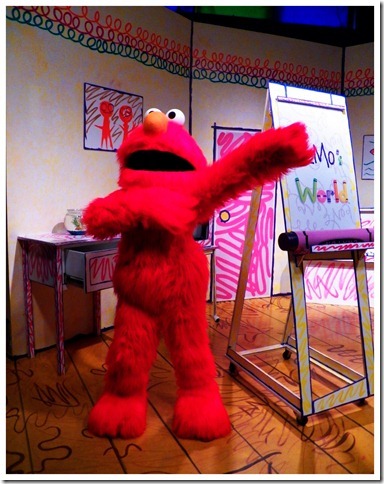 Adrian then took a nap with Daddy and I took my girl to see Elmo’s World Live, where we were excited to score front row seats. 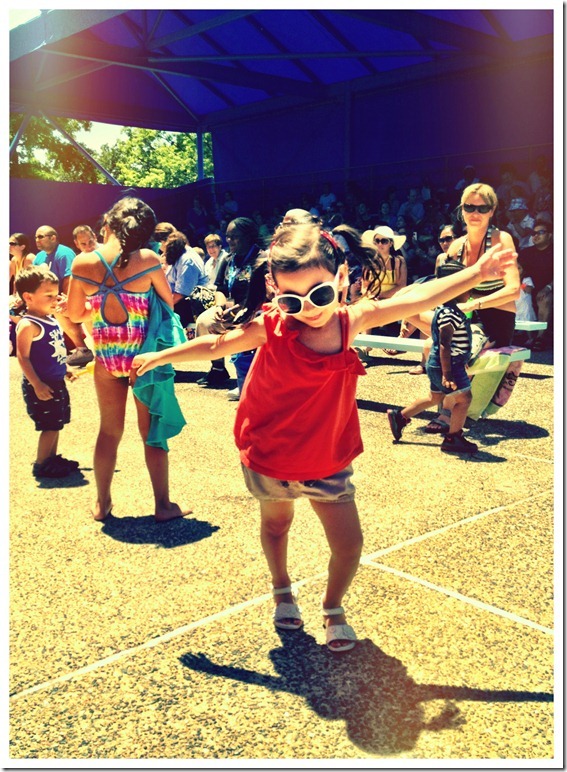 The interactive dance show really appealed to Lucia and I thought that Mr. Noodle’s dance moves were off the hook. After grabbing a quick dinner I was thrilled to notice that the souvenir cups and plates are BPA free. I’m so glad that we will be able to reuse them at home. 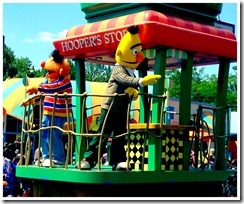 Right on Sesame Place! 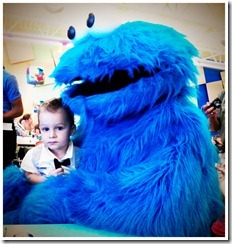 We ended our evening with another visit from Cookie Monster and Oscar the Grouch, over Elmo cupcakes at a blogger social. 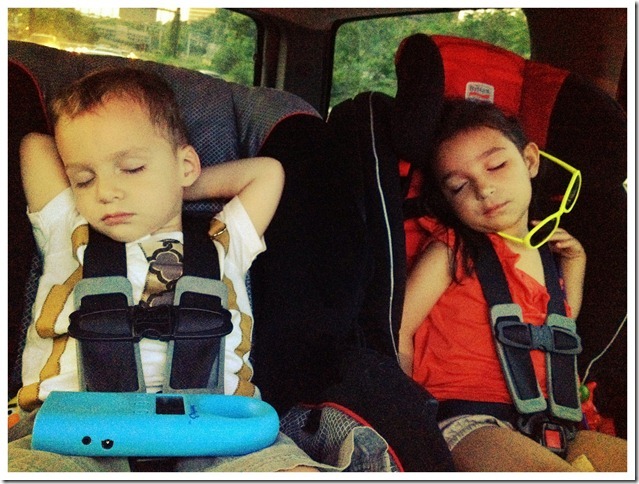 We capped off the night with a Super Grover sighting and little ones were soon sound asleep in their car seats. We then changed exhausted, limp bodies into P.J’s without even waking them. Can you guess where they asked to go the next day? What a memorable experience we all had. We will definitely be back for more. 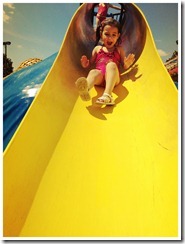 My family and I were given complementary admission tickets and parking to Sesame Place. All opinions are my own.